E-waste is trash that is created when technology is discarded. E-waste also refers to materials that are part of the manufacturing process. E-waste is a growing problem: it accounts for 2.6 million tons of trash every year in US landfills alone-that's almost 2% of all US trash, and a whopping 70% of overall toxic waste. What is RISO doing about e-waste? 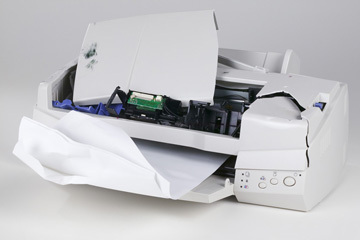 Well, RISO digital duplicators and inkjet printers are built to last. It's not unusual to print millions and millions of copies on a RISO printer. Because of this, the amount of e-waste that ends up in landfills is reduced, as well as the number of hazardous materials that can contaminate the environment.